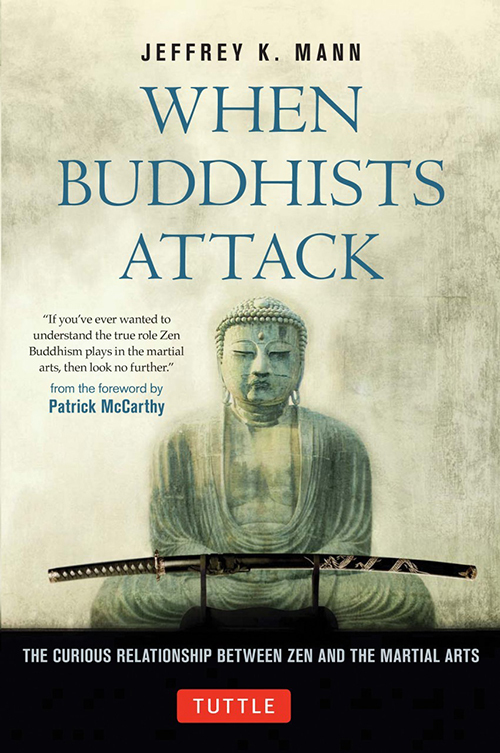 I recently finished "When Buddhists Attack: The Curious Relationship Between Zen and the Martial Arts" by Jeffrey K. Mann, and highly recommend it to anyone interested in exploring the relationship between Zen and the martial arts (in particular Zen and the Samurai). There are many things I liked about the book, but foremost among them are the facts that the author is an academic, whose field is religious studies, but who has also practiced Zen and martial arts. This means that he not only has a solid first-hand grasp of both Zen and the martial arts (in this case, Goju-Ryu Karate), but also has academic training in conducting scholarly research. The result is a work of breadth and depth that is surprisingly readable. The book began with a brief but comprehensive overview of Buddhism, and then moved into a more involved exploration of "Warrior's Zen." On the surface, it may be difficult for modern readers to understand how a form of sitting meditation such as Zen could be of use to warriors whose lives were defined by violent combat. Mr. Mann showed how Zen was in its own way the perfect complement to swordsmanship. Through regular and rigorous meditation, Samurai were able to train their mind to be "fluid and responsive." (p72). Additionally, Zen helped practitioners accept and overcome fears related to their own inevitable death. Thus, on the battlefield practitioners would be more likely to maintain clarity of thought, and be less likely to hesitate or choke up at critical moments. "True zazen is not a pleasant escape from our daily lives. It is discipline. Meditation that is not rigorous in its mindfulness is what Omori Sogen calls 'empty zazen.' Such easy sitting 'will be of no use no matter how long, how often, or for how many days we may sit during sesshin. It is far better to sit earnestly even for five minutes.' So, those who find their zazen to be painful, difficult, distracted and mentally exhausting can appreciate that they are not wasting their time." (p 117). As one who often struggles with distractions during meditation, I especially appreciated this advice! "a strong mind while sitting will be a strong mind while standing; a strong mind while standing will be a strong mind while fighting" (p 119). an increased sense of mental and physical well-being, etc. "...we might say there are benefits to zazen; then again, we might not" (p 123). The next two sections were of particular interest to me. The first section, "Mushin and mindfulness" explored both Zanchin and Mushin primarily (but not exclusively) within the context of martial arts training and practice. Mushin (the notion of "no-mind") is a concept that is frequently misunderstood, as is the related concept of Zanshin (a sort of passive alertness and awareness). These concepts were examined using examples from Kydo (Japanese archery), Aikido, competitive sport karate, and shodo (Japanese calligraphy), among others. It was refreshing to read about them within these contexts. The next section, the chapter on Ethics, got into the seeming contradiction of how one who engages in a spiritual practice that is rooted in non-violence can engage in violent acts. At a certain point, anyone who has trained in the martial arts and has an ethical framework which values non-violence is confronted with this contradiction. Indeed, to me this quandary formed the heart of the book. This chapter was nuanced, and explored not only how practitioners themselves could frame violence (for example, justifying a violent act if it prevented greater harm), but also how Zen teachings could (and have been) misused in order to justify violent actions. In the final chapters, "The Contemporary World of Budo" and "Is it Zen" the author looked at the current state of Budo (primarily Judo, Karate, and Kendo) and wrapped up trying to answer whether Zen is, in fact, present in the practice of Budo. As in the preceding chapters, the author delved into these areas thoughtfully and critically. When I finished the book I felt like I had been on a wonderful journey. Overall, I think that this book is one of the best non-fiction martial arts/ philosophy books I have read. It stands alone as a comprehensive inquiry into the relationship between Zen and the martial arts, and (with its varied source material, all fully cited) can be used as a jumping-off point for further research/ inquiry. At 208 pages it is fairly easy to get through. I also suspect that other readers (like me) will be coming back and re-reading for years to come. NOTES: My deepest gratitude for this review from my friend, Greg Jahiel, who is a student of both Zen and the martial arts! Domo arigato gozaimasu Greg!! Please check out Greg's other review: REVIEW: Greg Jahiel - "Smile at Strangers" by Susan Schorn. For more information, please check out Tuttle Publishing.